Valentine’s Day is coming up in just a couple weeks and it tends to be very chocolate heavy in terms of desserts/gifts. So I wanted to do a nice, simple dessert that wasn’t chocolate but still had Valentine’s vibes. This cake is from a box – but you could use your favorite cake recipe. The amount it makes is perfect for a dinner party too so if there’s a bunch of you getting together in sadness or celebration this is what you should be serving. Make the cake batter according to the instructions on the box then bake on a parchment lined half sheet pan (18×13″). Sprinkle the graham cracker crumbs over the top and bake for 15-18 minutes until the top is golden brown and a toothpick inserted comes out clean. Let the cake sit in the pan for 20 minutes then use the parchment paper to lift it out of the pan and set aside to cool completely. 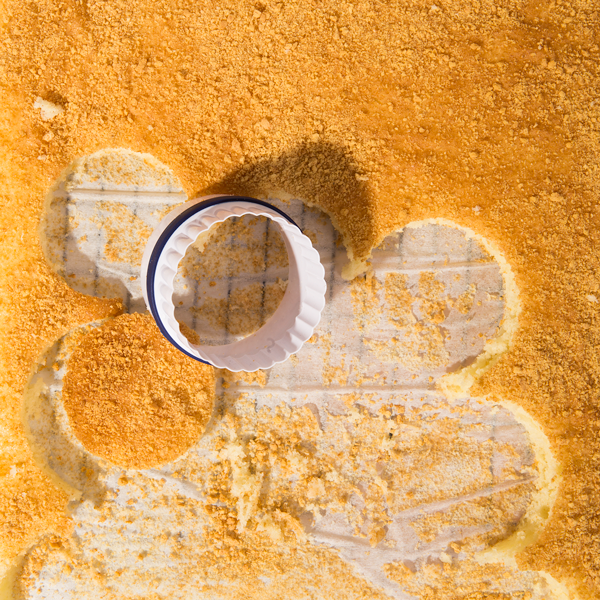 Once the cake is cooled and you’re ready to assemble, make the ‘cheesecake’ by beating together the cream cheese, powdered sugar, and ground up freeze-dried strawberries in the bowl of a stand mixer fitted with the whisk attachment. Scrape up the bottom and sides of the bowl then add 1/2 cup cream to whisk it all together so you lighten up the cream cheese for about 30 seconds. Once that’s happened, add the rest of the cream and beat on medium high speed until the mixture has thickened and is light and fluffy. Transfer the mixture to a piping bag. To assemble, figure out how big the cake needs to be to fit snugly in the serving dish and cut out rounds from the cooled cake. Place a cake layer in the dish, pipe out an almost even layer of the ‘cheesecake’ then repeat with another layer of cake and ‘cheesecake’. Wrap with plastic wrap and refrigerate for up to 2 hours if not serving right away. I guess it’d be a nice idea to cut away the caramelization at the top and bottom of each layer? also, how would you slice it? ANyway, thanks for the cute idea! They look so perfect for Valentine’s Day! They are beautiful, and they look delicious! 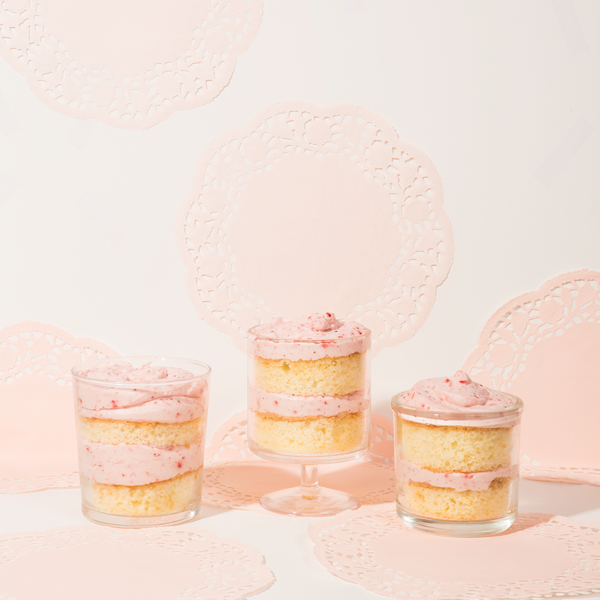 There’s just something about a fluffy pink dessert, isn’t there? I will definitely be trying this recipe out soon! I love these! 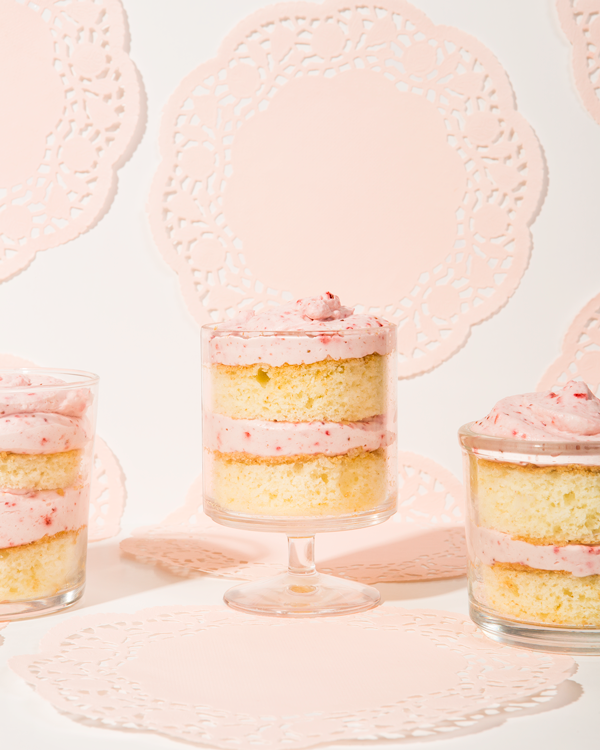 Strawberry is my favorite – in fact, I might just have to make these with strawberry cake. And then you get more pink as a bonus! I’m trying to think what I could serve these in (half my stuff is in boxes awaiting a move so no need for something new). Do you think this would work cupcake size? 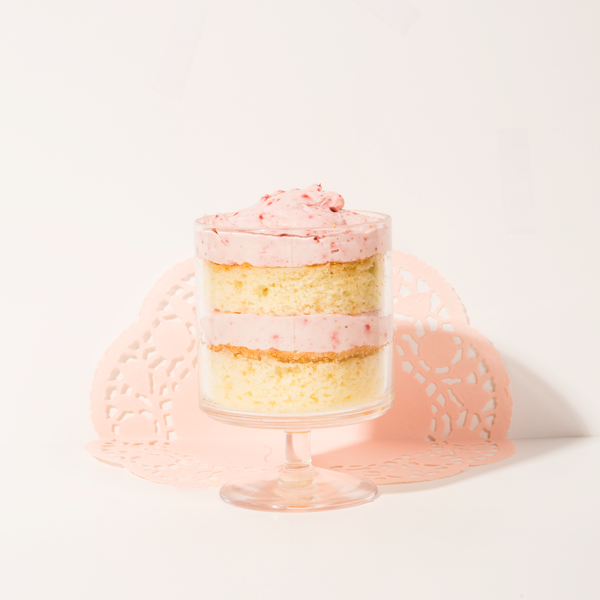 you could totally serve these as cupcakes with the cheesecake portion as frosting, I tend to just use some short drinking glasses when making smaller trifles because I have so many of them but any smaller dish or glass should work!